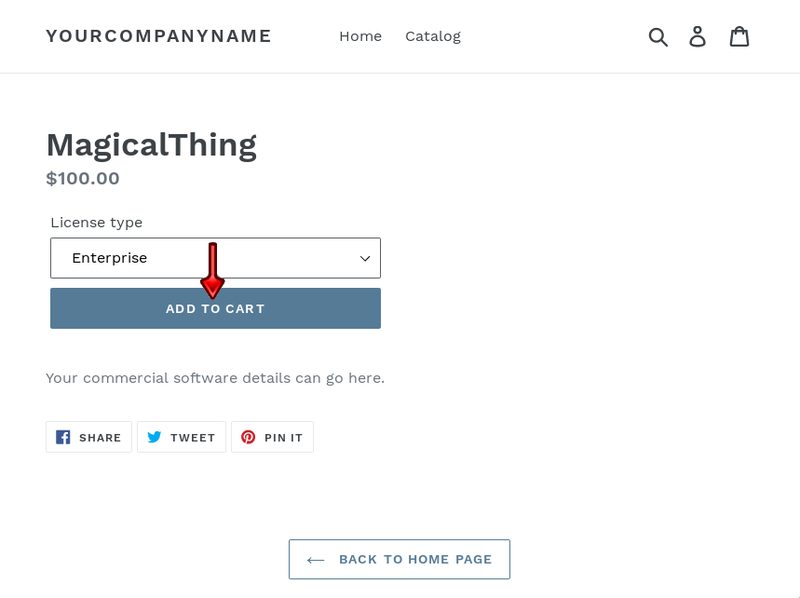 Assume you built a product named “MagicalThing” and you think it’s ready to be sold. The only bit missing is how to license it and start selling. You can make that happen in a few minutes with the help of this guide. You can provide an “option name” to describe your type of license. 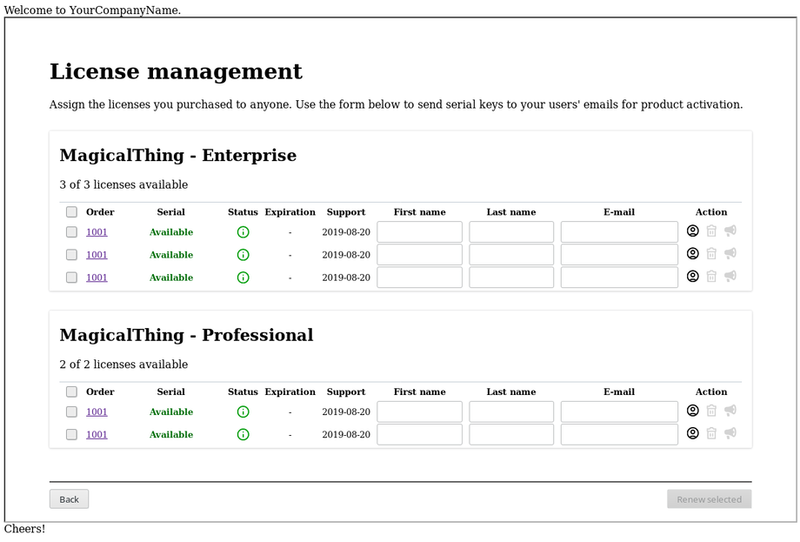 In the image below we used “License Type” as the option name, with values “Enterprise” and “Professional”. Each variant will come with different prices. In our example, “Enterprise” licenses will cost $100 and “Professional” licenses $75. Let’s can get started with the actual licensing part. You won’t be charged during the trial period so don’t worry too much about it just yet. 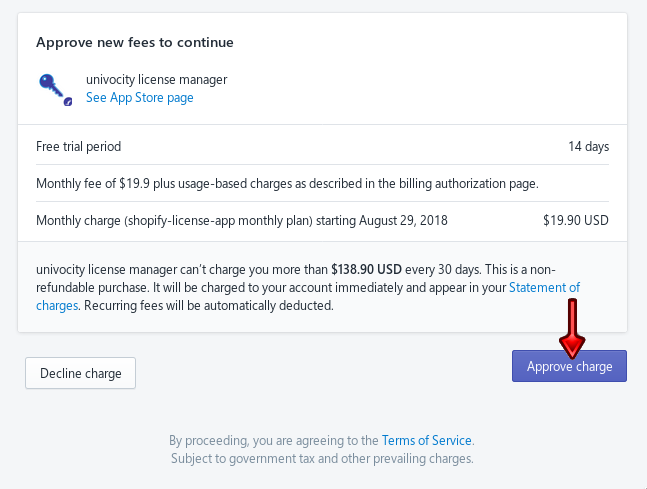 You can adjust the monthly amount the app can charge your store in total usage-based fees before proceeding. This limit can be updated at any time later on. 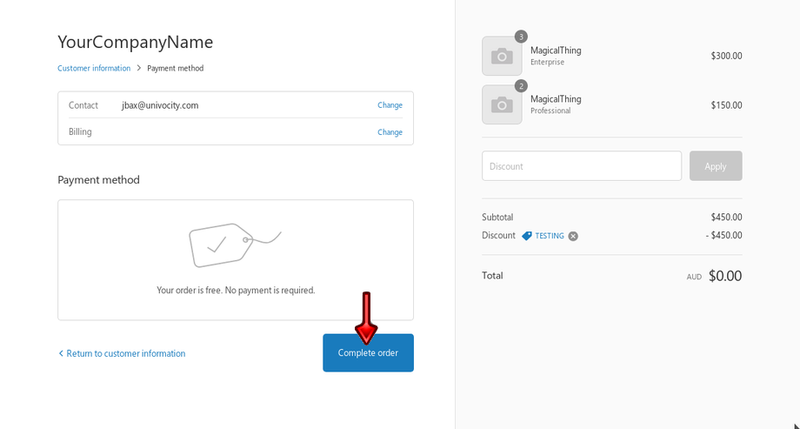 After approving the charges via the Approve charge button, you will be redirected again to your shop admin page. Let’s get back to the Apps section, which should now display how many days free you have left to try our license management system. 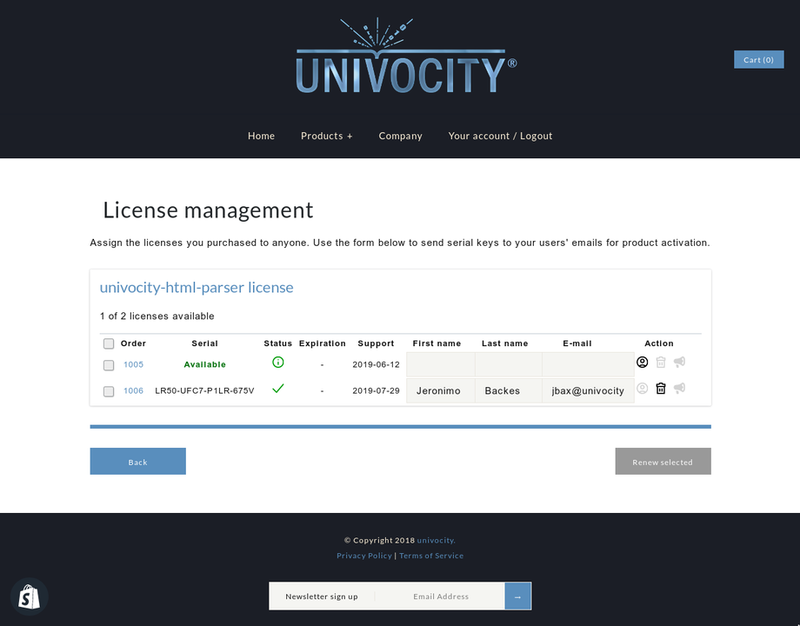 Finally, the app becomes accessible and when you click on the univocity license manager link you should see its configuration panel. 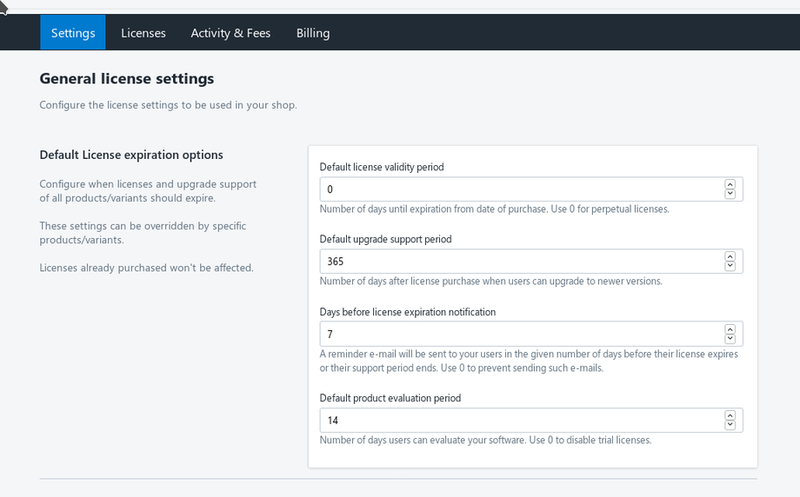 The Settings tab gives you options to configure the behavior of your licensing system. Let’s quickly introduce them. In this section you can provide default values for all licenses of all products you intend to sell. These defaults can be overridden for any given product or any given variant. Note that any changes here will apply only to new licenses. Existing users won’t be affected. 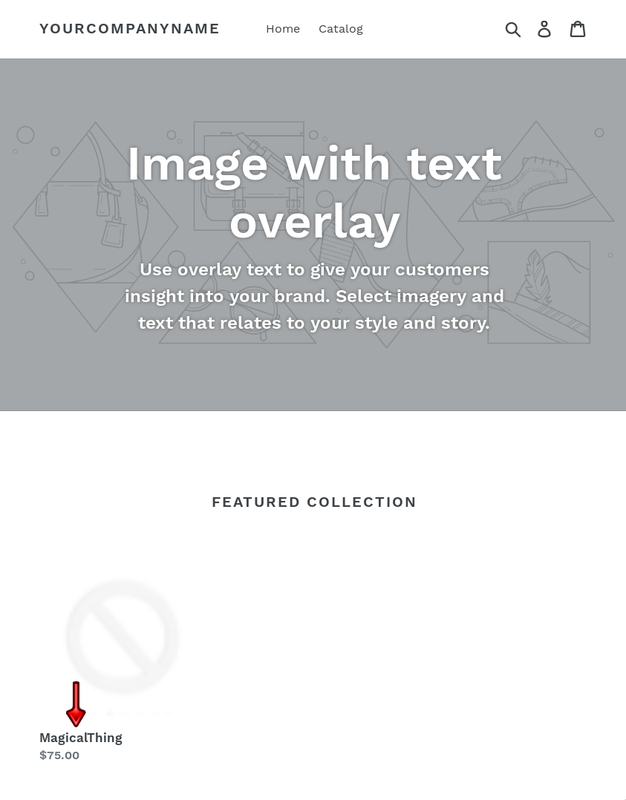 You can edit these templates to suit your needs. 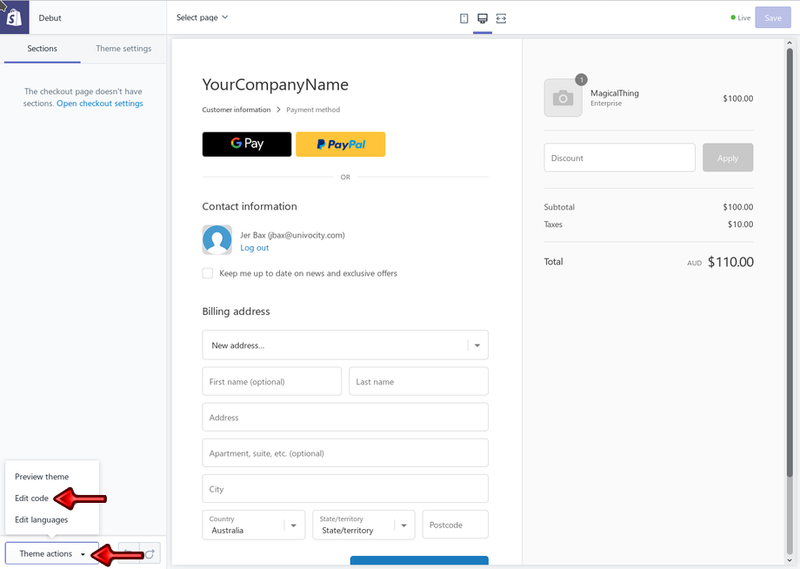 The templates have special fields that will be replaced with the appropriate values before an e-mail is sent to your customers. 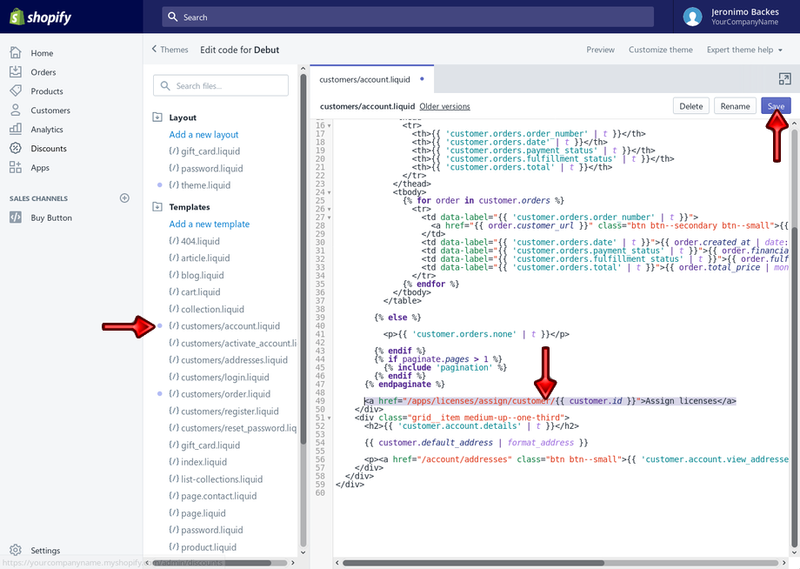 On the left hand side of the template editor all available fields are displayed and can be clicked on to insert the tag into the template. Note that some of the fields are mandatory and must be present in the template. Once you finished editing you can test the template by clicking the Send template test e-mail button. You will receive a rendered test e-mail shortly after. This is what your customers will receive from our licensing system. 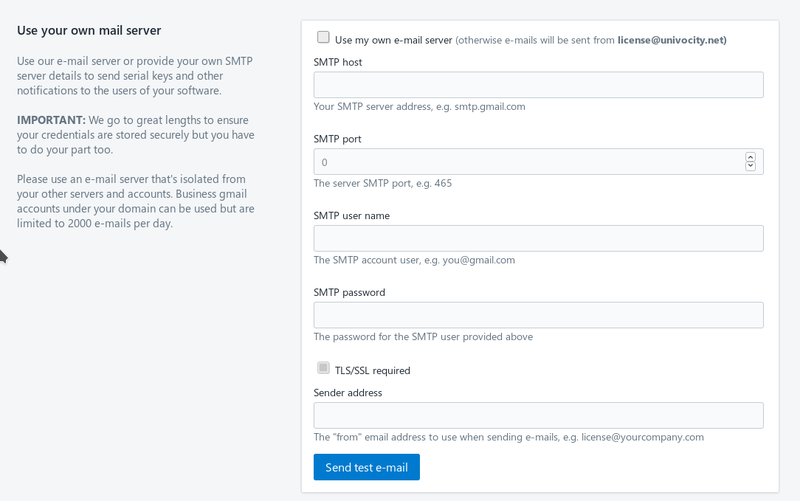 You can use the Send test e-mail button to check if your configuration is working and e-mails are being correctly sent from your server. Once you are happy with your setup, save the changes and proceed to configure the licensing options of your products. 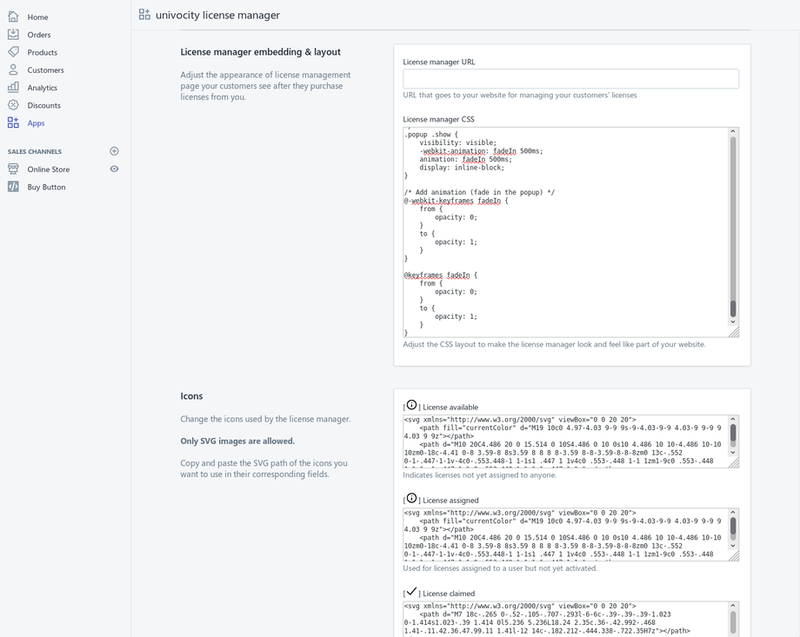 The license manager is the page shown to your customers from where they can manage the licenses they have purchased. This includes allocating or removing licenses to one or more users and renewing their existing licenses. Its usage is covered in section Enabling the client license management interface. Note that only SVG paths are allowed as icons, without scripts or external references. 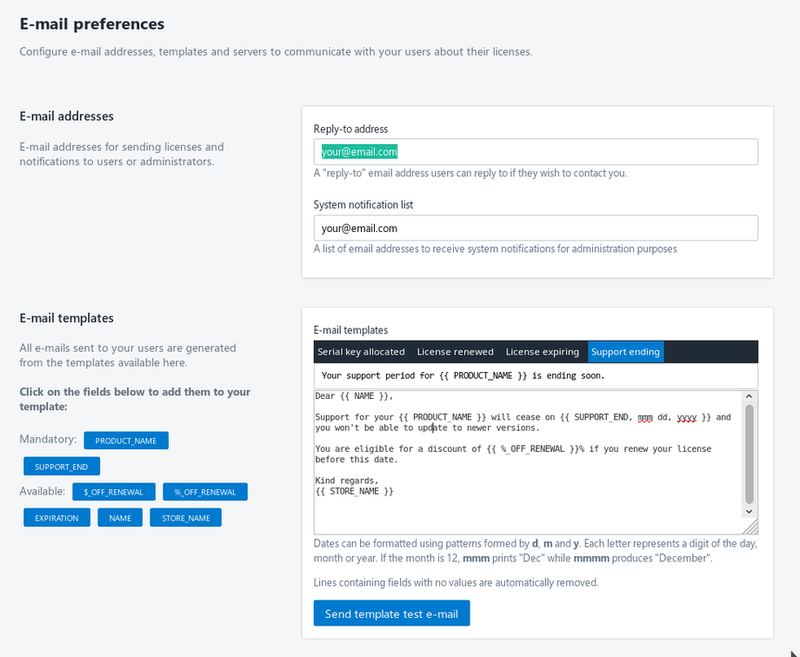 There is also a License manager URL field which allows you to embed the license manager in your website through an iframe, as explained in Embedding the license admin page in your website. You will probably want to make adjustments there later on, but let’s move on to see how things work. The following sections explain all the options in detail. You will need to copy or download the template generated for your product and integrate it into your software. The JSON template has basic information about your product. Every request your software makes to the license server requires this product information. 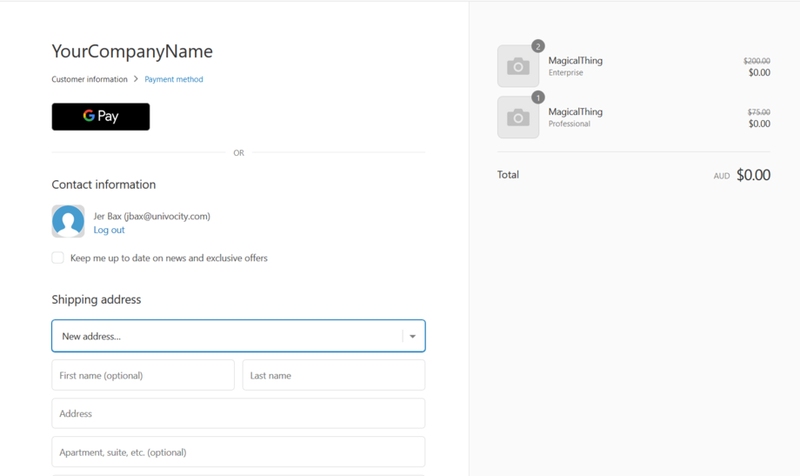 There’s a dedicated tutorial explaining how to use this template in your code in section Integrating the license manager with your product. The Java class template has a class that can be directly included in any java-based software. We explore how to use that class on your code in section Integrating the license manager with your JAVA software. 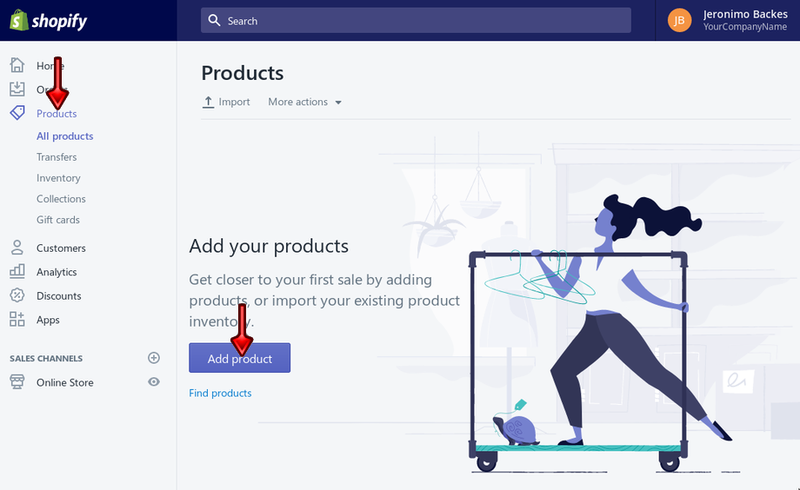 Regardless of the template type, you must change the template to provide the correct product version and its release date. Every time you release a new version of your software, make sure to update this information. Variant from license: is meant to be integrated in a software that has a single binary version distributed to customers. When a client purchases a license and activates it, your binary will have to check what license variant is in use, and activate (or deactivate) some features based on the license type. 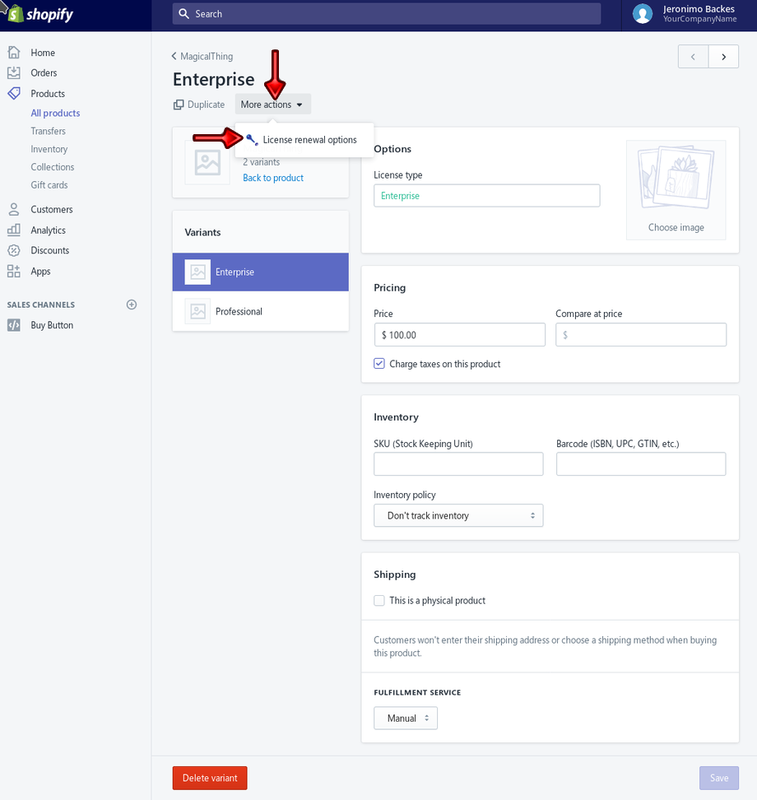 Enterprise: in our example, this is to be integrated in a software that is built exclusively with enterprise features, available only from an enterprise binary distribution. If your client downloads the professional binary and try to activate their enterprise license, the license activation will fail and they will have to download to the correct distribution for the license they own. Professional: in our example, this is to be integrated in a software that is built exclusively with professional features, available only from a professional binary distribution and possibly with less features than an enterprise software. Customers that purchase our MagicalThing - Professional license can only use the professional version of our software binary. When no variants have been defined for your product, the only option will be the Variant from license explained above. 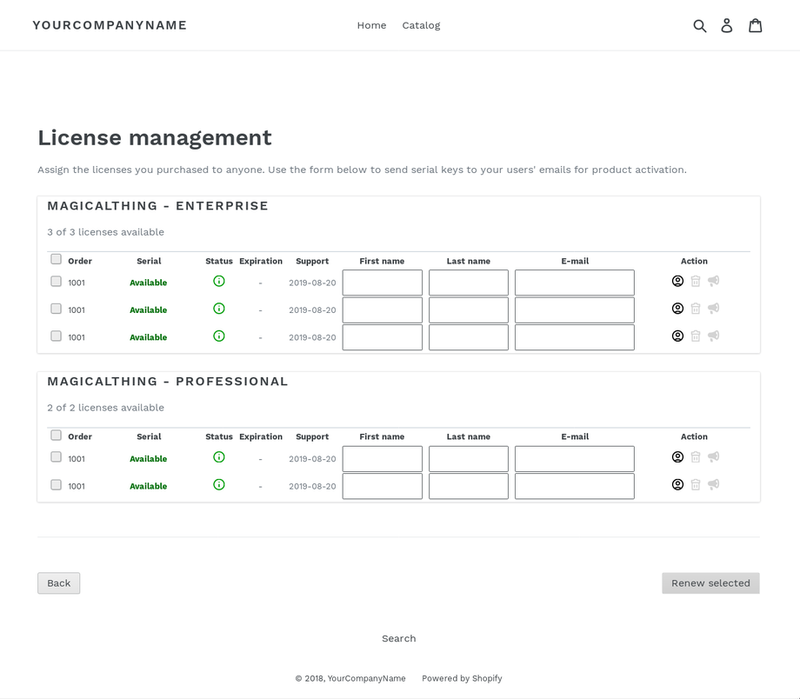 Using Variant from license is a good default as it allows you to release your product and later change the licensing options available. For example, you may want to introduce perpetual and per-year license variants that expire after 12 months without affecting builds of your software that are already being used. Here you will be able to determine different license transfer options for the licenses you sell. 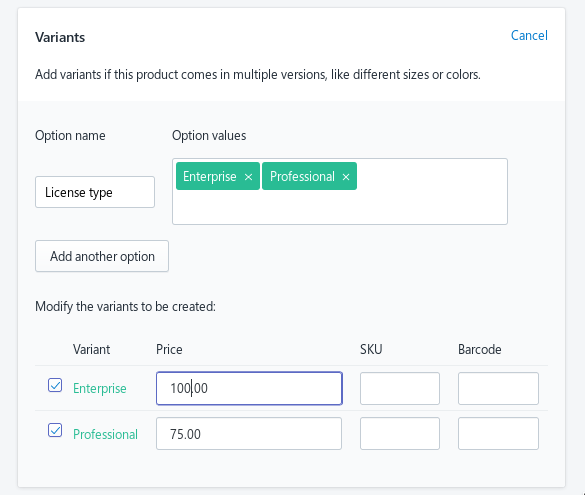 These options apply to your product and all its variants and can be configured individually for each variant. No restriction: a license can be used by someone and later transferred to someone else. This is typically used for companies who buy a set number of licenses to be used by a number of employees. New device of same user: a license can only be used by the person who activated it. For example, once a serial key is activated, it can only be used again in association with the original e-mail and name of the person authorized to use it. If the user changes his/her computer for example, they can deactivate the license used in their old system and re-activate it on the new one. No new devices: a license can only be used by the person who activated it, on the system it was activated in. The license can’t be transferred to another system nor another person. If the user changes his/her computer for example, he/she will have to purchase another license for the new system. 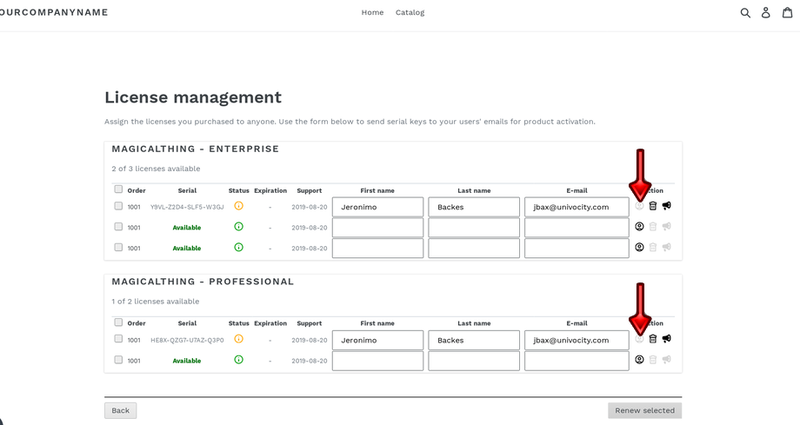 Additionally, the Allocate licenses automatically option configures the server to generate and send license key e-mails to the customer immediately after his/her purchase is completed. All serial keys will be initially associated with the customer e-mail. 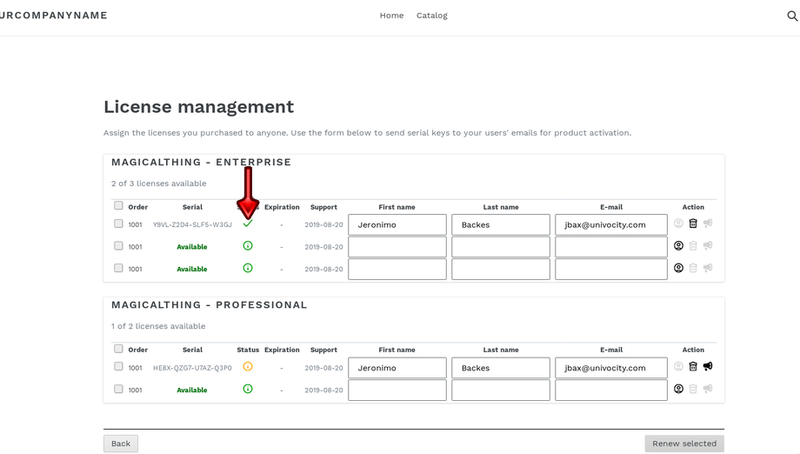 If required, they can be reallocated to other e-mail addresses by the customer himself on their license management page. These values can be overridden for any given variant of your product. 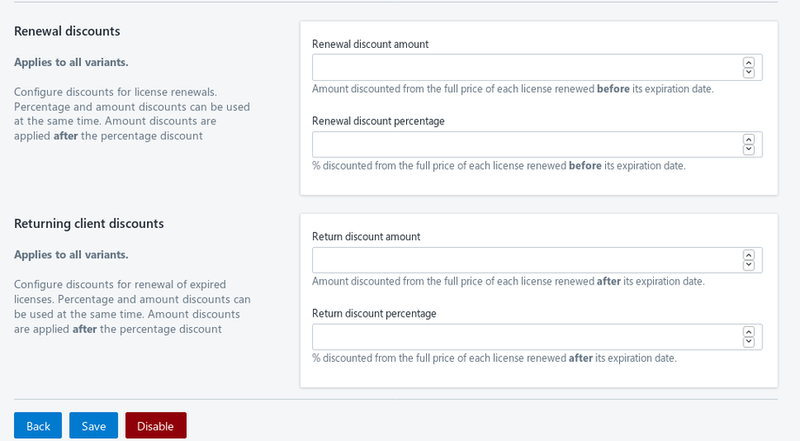 Renewal discounts apply to the full price currently set for your product and variant before your customer’s current license expires. If the license is perpetual - i.e. no expiration date defined) - the discount will be applied if the renewal occurred before the support end date. After the license expires, or the support period ends when the license is perpetual, the Returning client discounts will be used, if set. These values can also be overridden for any given variant of your products. Before you start selling licenses, make sure the checkout process will work for your use case. There are a few steps to take. Click on the Checkout, where all relevant options concerning the purchase workflow are available. 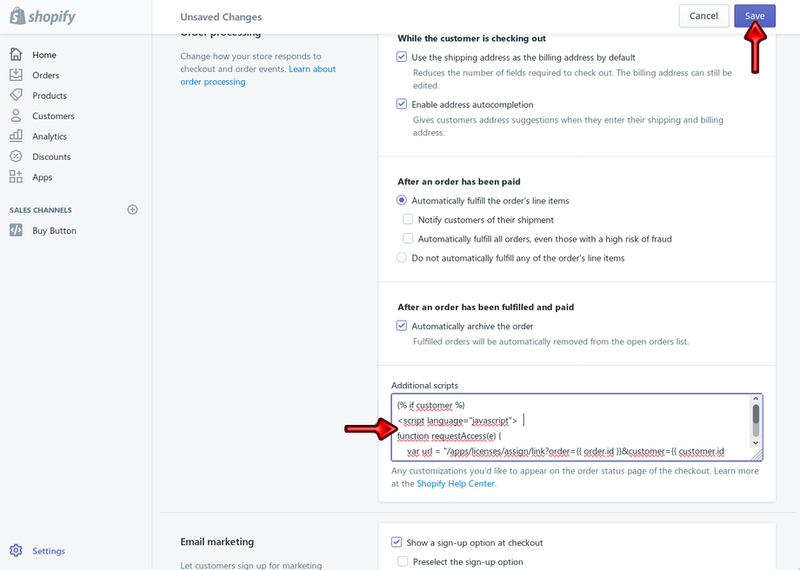 Shopify can manage customer accounts for you, and enable a customer area to which they can login and where all purchases they made from your store will appear. 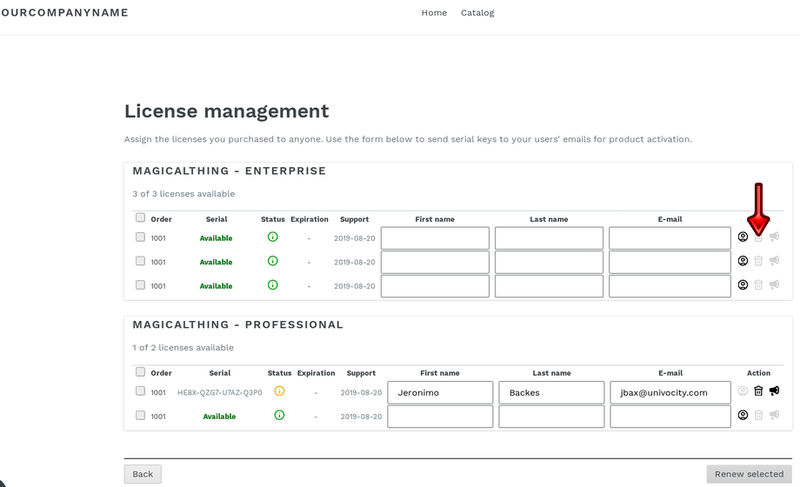 From that customer area you can later put in links to the license administration page, as shown in section Enabling the client license management interface. 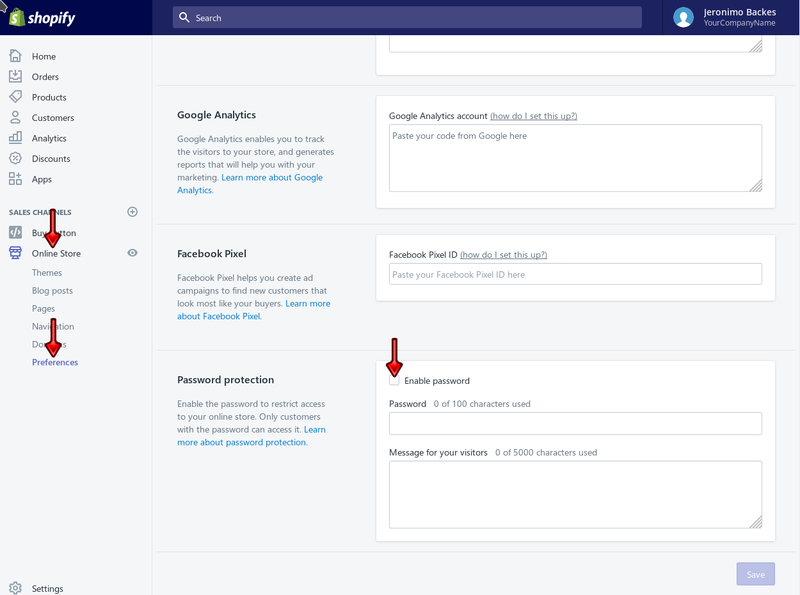 If you use Accounts are disabled or Accounts are optional, users who don’t create an account will only be able to access the license manager interface from a temporary access link sent to their e-mail. 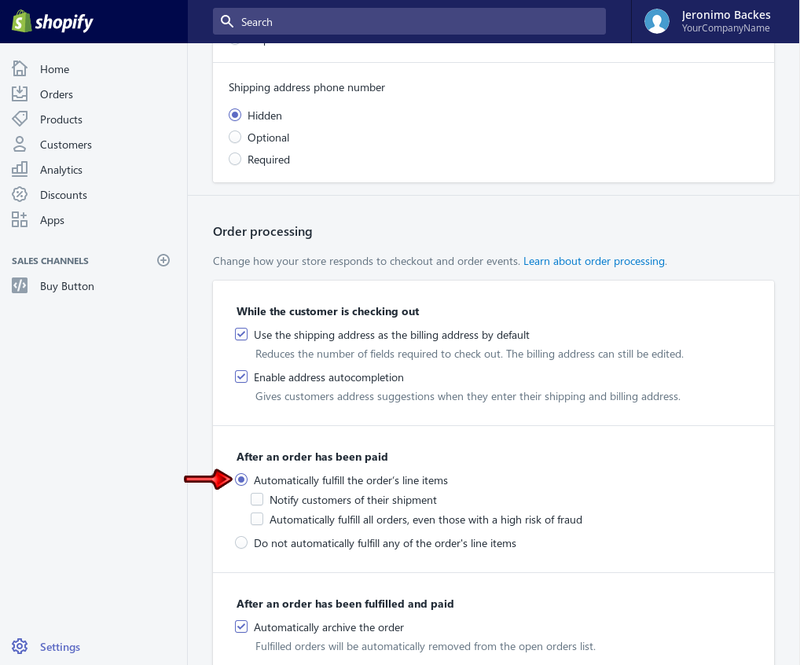 The default checkout process in Shopify allows users to finalize a purchase without providing an e-mail address. However, when you are selling software licenses having an e-mail to communicate with your customers is essential for the license app. Let’s make sure customers can only complete their purchases if they provide a valid e-mail address. Scroll down to the Customer contact section. There, select Customers can only check out using email. 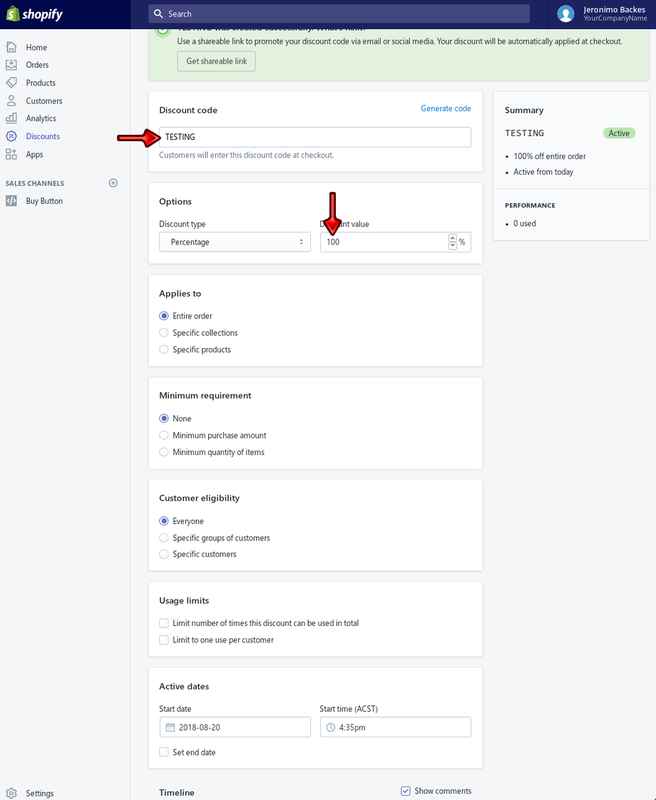 While you are there, you might also be interested in selecting Automatically fulfill the order‘s line items under After an order has been paid, otherwise you will have to manually approve every customer’s purchase - and potentially make them wait a while before they can use their license. The following only applies if you have a Shopify Online Store sales channel. By default the online store is password protected and you must disable that for the server communication to work. The shop is ready for customers to buy licenses now. 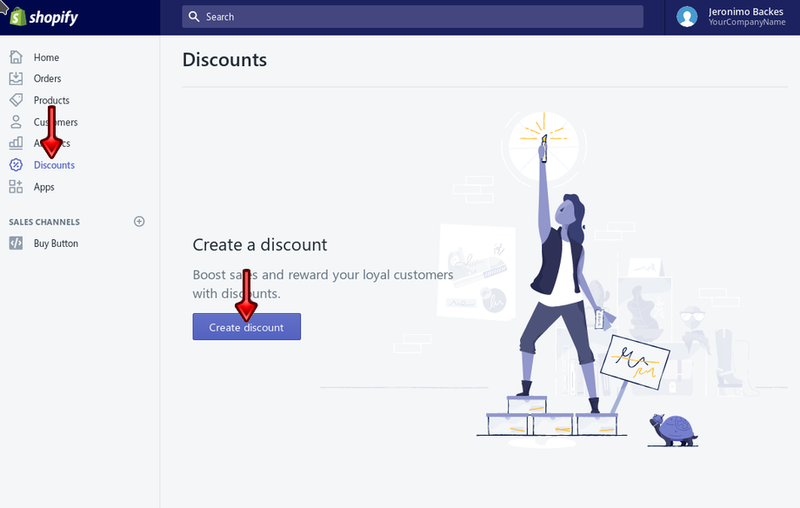 To test how your users will interact with your store and your software, without actually spending money on it, we can buy our own licenses using a 100% discount code. Now let’s get to our shop and buy a few licenses. Finally we can purchase a license. The whole process is managed by Shopify but you have some degree of freedom configuring how it works and looks. You can use their services to run your software store or simply integrate a buy button into your existing website, as detailed below. 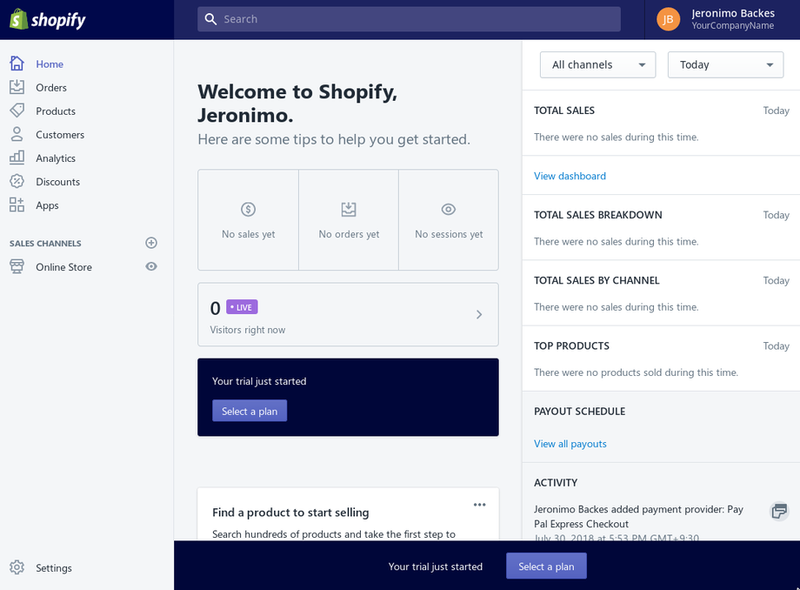 If you plan to use your Shopify store, skip to the next section, Purchasing from the Shopify Store. 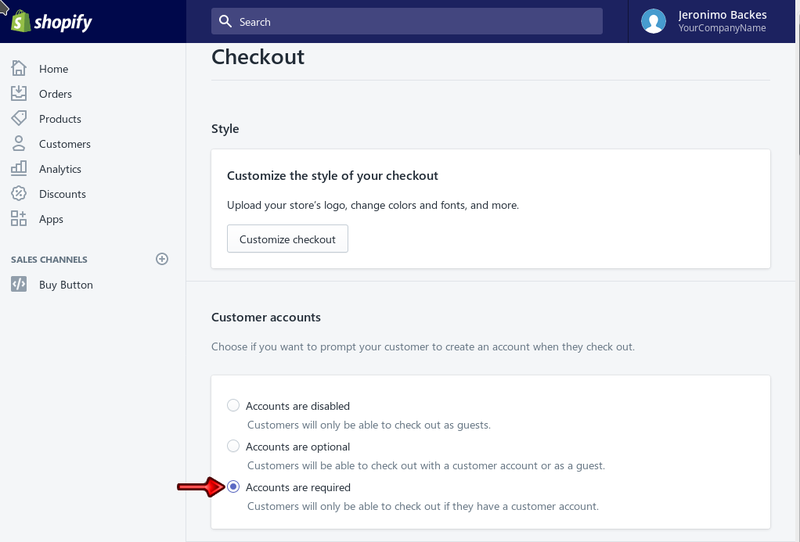 Clicking on the Checkout button will start The checkout process. 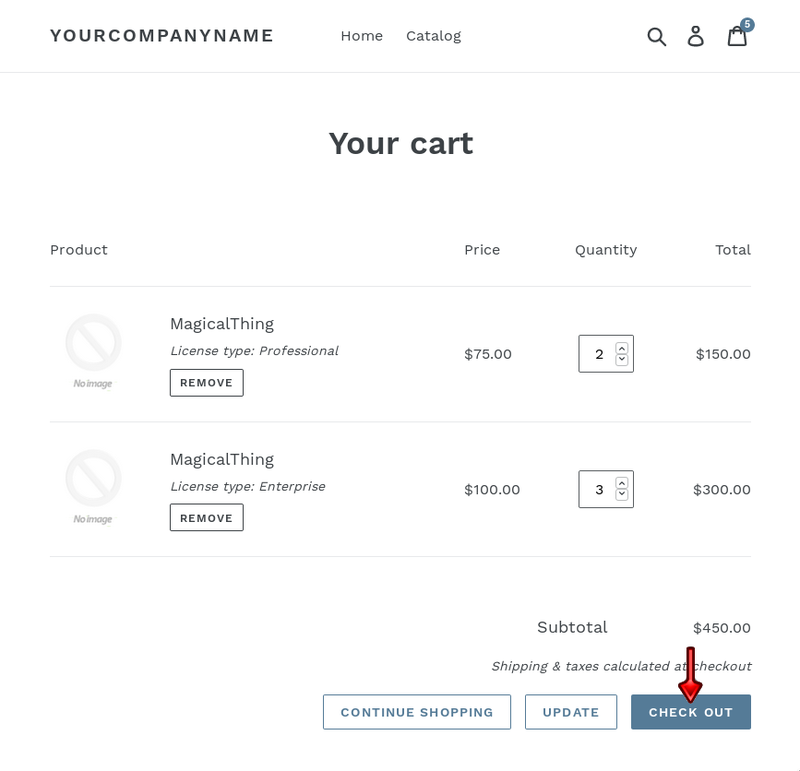 Your online store should be available at https://yourcompanyname.myshopify.com/ (you can use your own domain instead if you want). The default theme is really plain but you can easily switch themes and customize them to your liking. The shopping cart works like the ones you find in any online store. 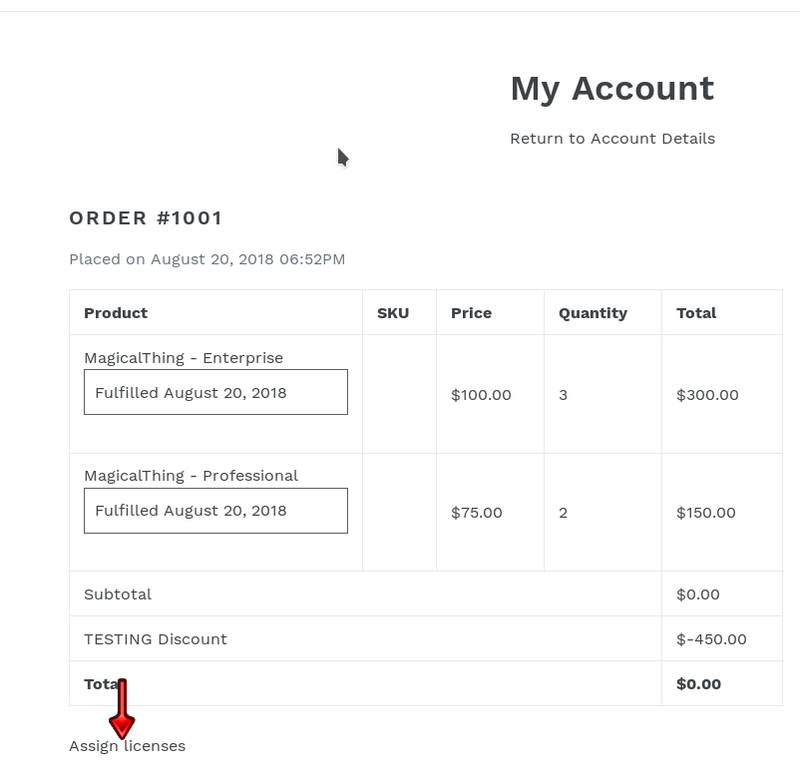 Clicking on the Checkout button will begin The checkout process. 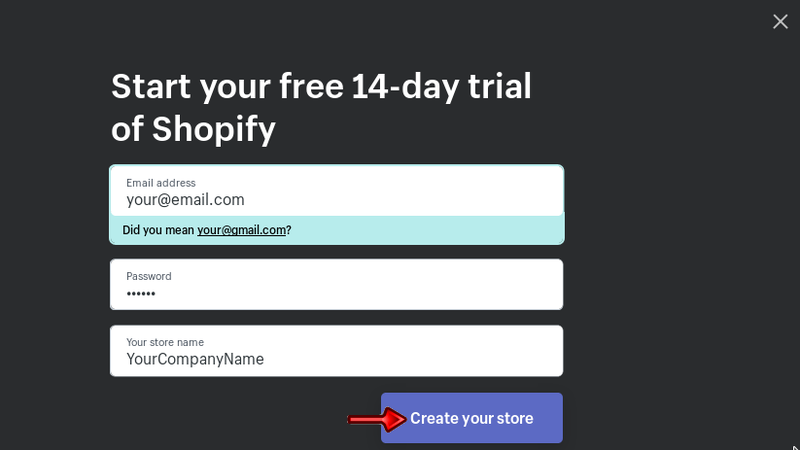 Shopify will also send you an e-mail with your order details. By default it looks like below. The View your order button will take you to the order completion page shown above. Now that you have purchased some licenses as a customer would, you need to allocate these licenses to the users who are going to use the software. A minor step is required to enable the license allocation interface to be accessible to your customers. 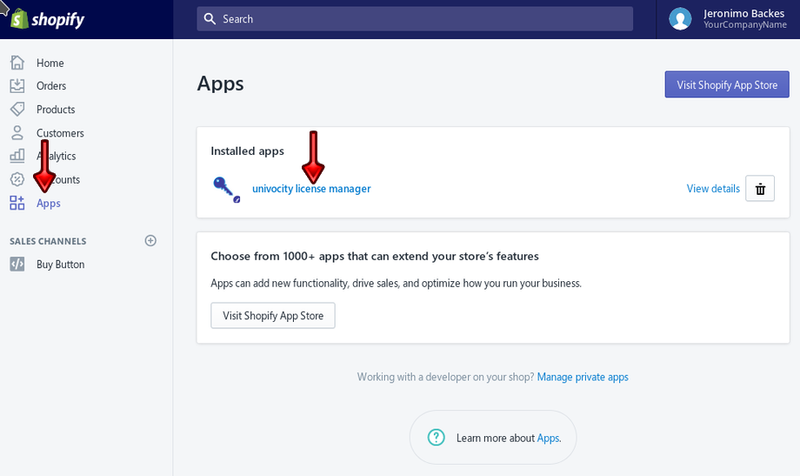 You need to customize your shop to introduce a link to the license manager user interface, where customers can allocate licenses to the actual users of the software. 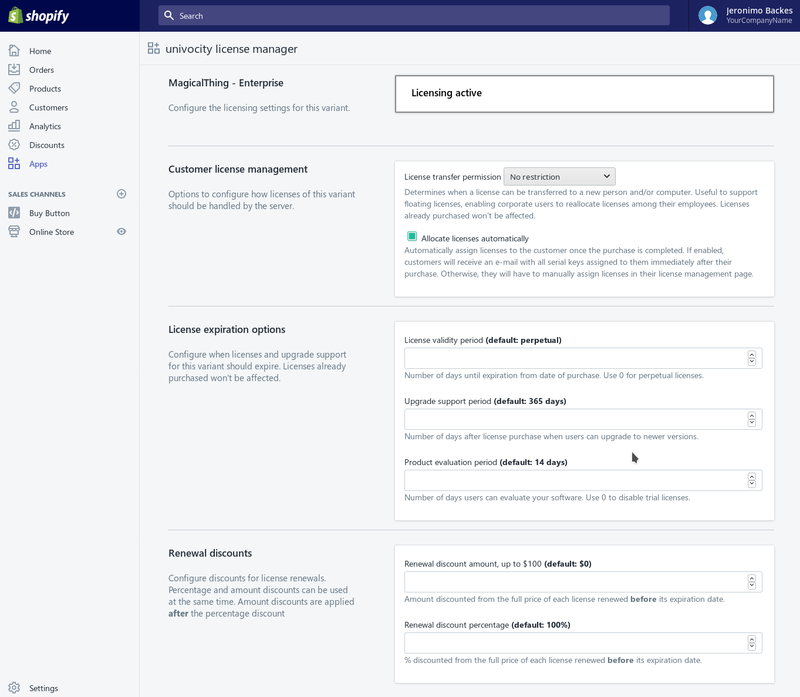 If you are selling licenses with Customer accounts enabled: you can force customers to create an account, then from their account page (or any other page that makes sense to you) they can use an Assign licenses link which will take them to the license management page. If you are selling licenses with Customer accounts disabled: there won’t be a customer area. 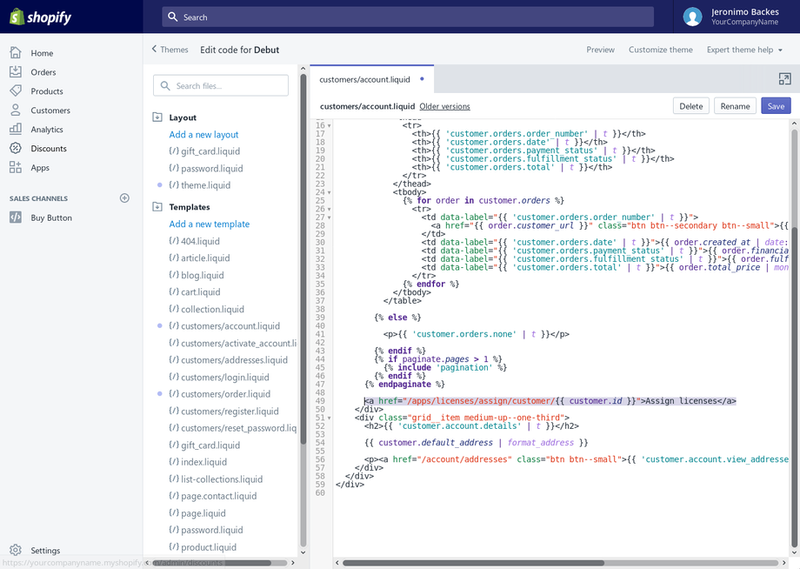 You can only add an Assign licenses link to the order completion page, as explained in section Managing licenses from the order completion receipt. 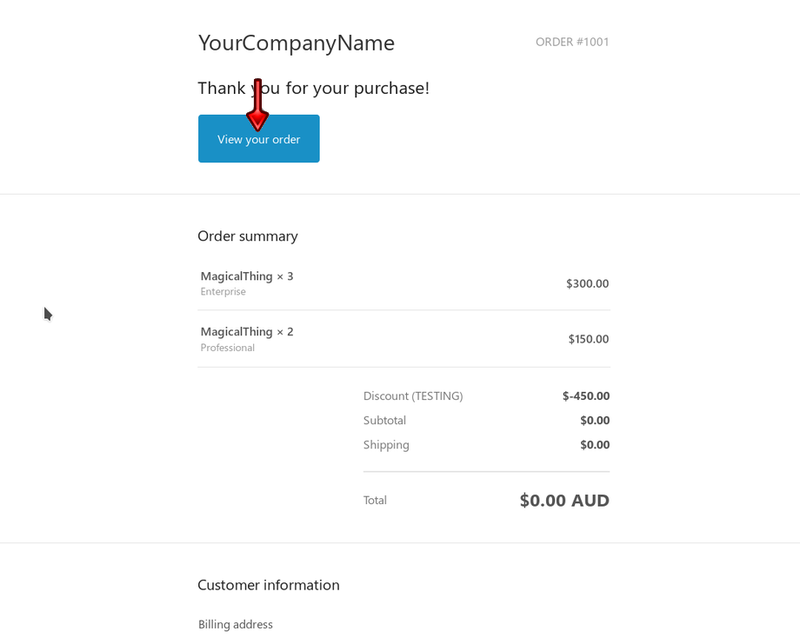 After every purchase, customers will receive an e-mail with a View your order button which takes them to the order completion page. Choose Checkout and on the page that opens click the Customize checkout button. 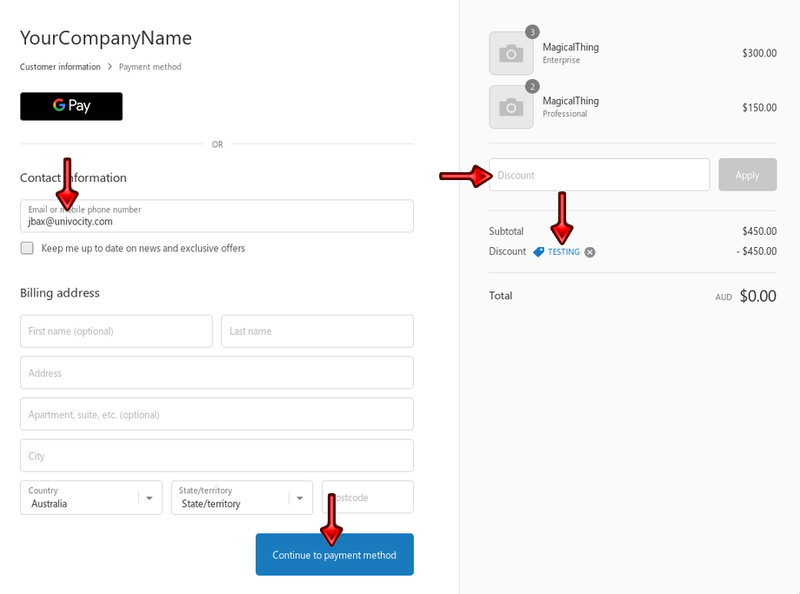 Under the Templates folder, select the customers/account.liquid template. 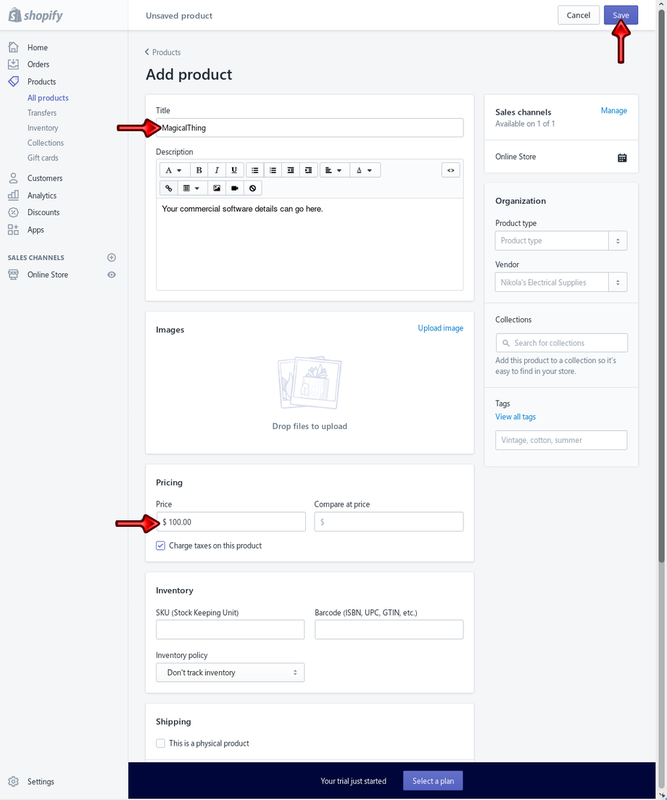 This template has the code used by Shopify to render the customer account page. You can modify it at will. This is what your customers will see once they purchase a license from you and log into their account. Section The customer license management area explains what customers can do with their licenses. 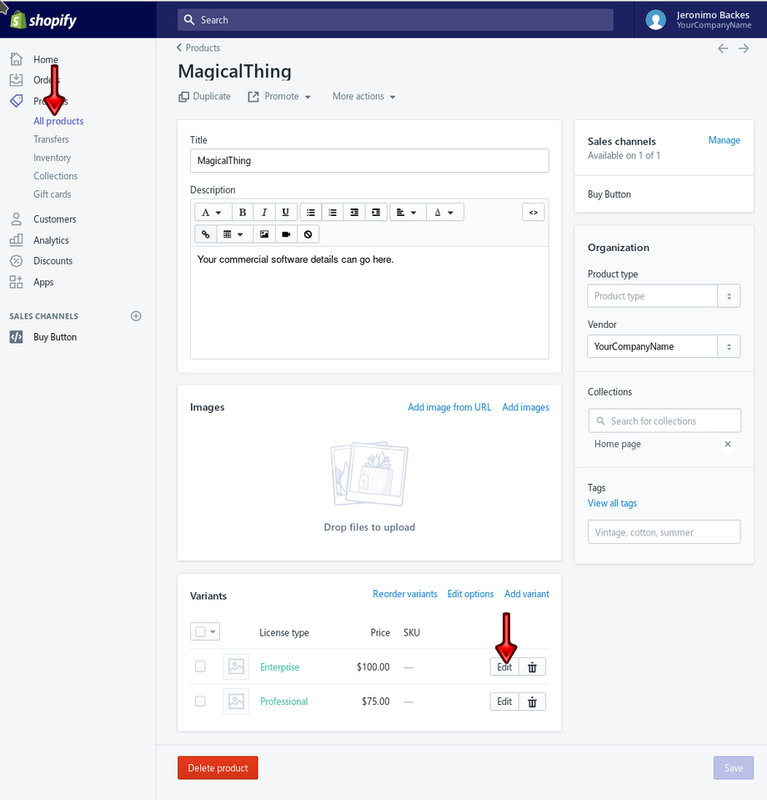 Again, you can customize the theme to your linking and use a different approach to open the license manager. Just make sure the final URL is /apps/licenses/assign?order=&uid=. 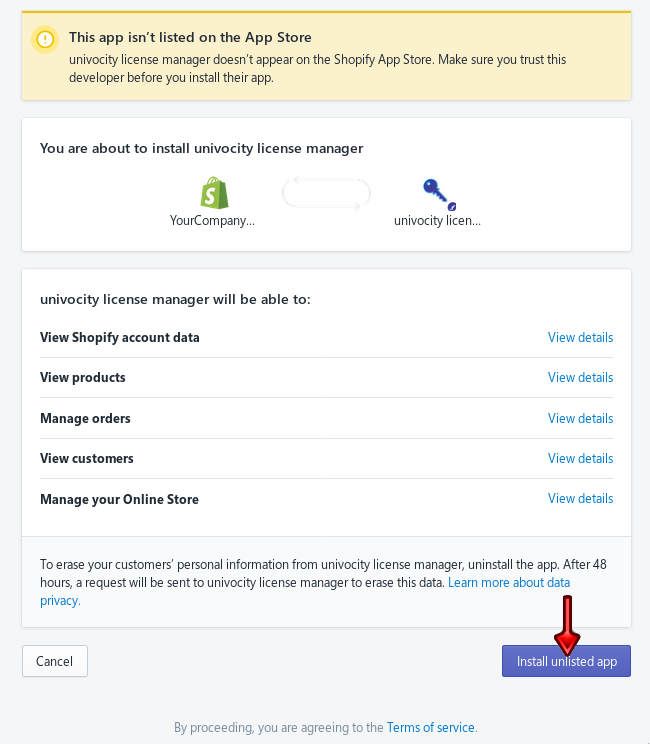 The following steps are optional if you want to give your customers with accounts a shortcut to get to the license manager. 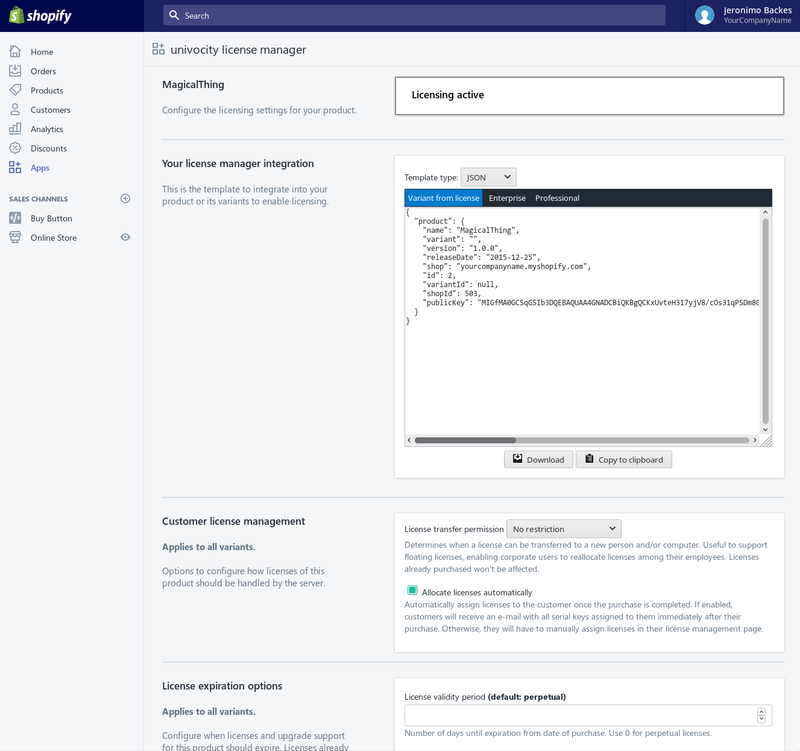 If customer accounts are disabled or are optional, the only place where the license manager will be accessible for them is from the order completion receipt. In this case you must take the following steps. If you have customer accounts enabled, you want users to be logged into their account so they can access and manage their licenses. The following code can be pasted into the Additional scripts text area. If the user is not logged-in, they will be asked to authenticate before entering the license management page. 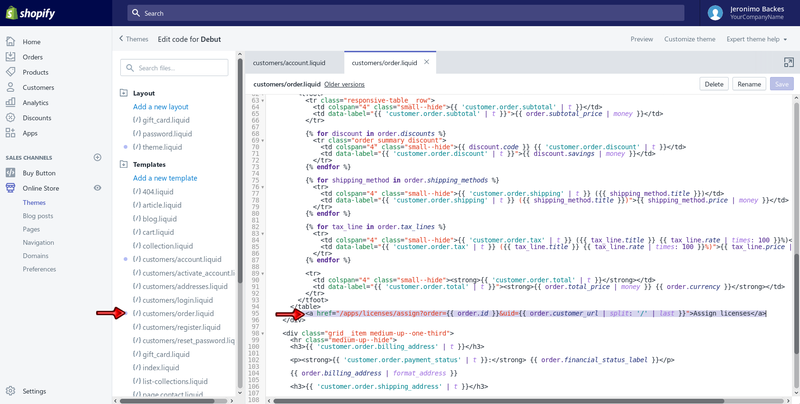 This script will generate a temporary access link that will be sent to the customer’s e-mail address. After you save your changes, refresh the page of your purchase order details. 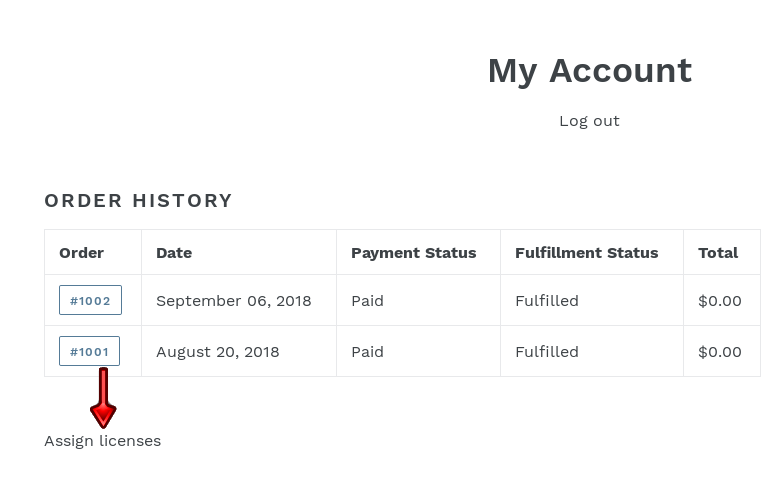 If you closed the window you can go back to the e-mail Shopify sent earlier (as shown in The checkout process) and click on the View your order button. 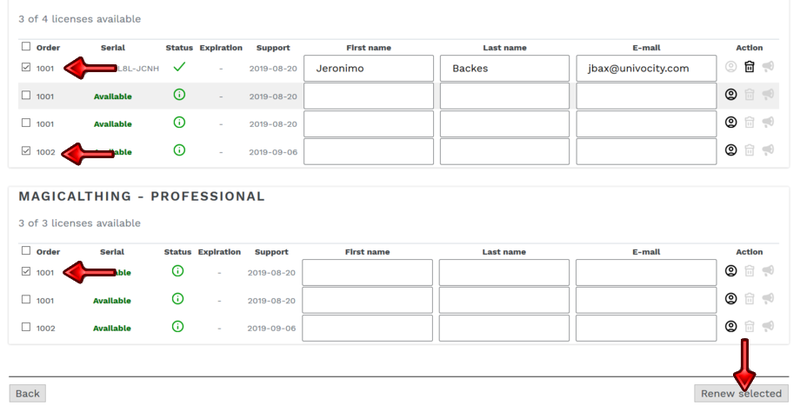 You can style the license admin page almost freely using CSS, as explained in section License manager layout so don’t worry too much about the looks of it yet. When a customer clicks the assign licenses link, an e-mail will be sent pointing to this URL. Note that the URL must have a parameter. 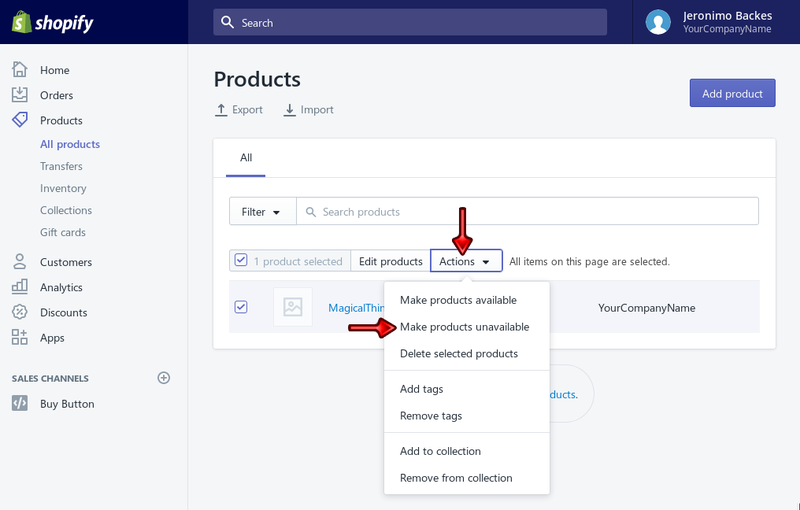 Your page has to extract the token generated for the customer and internally open https://yourcompanyname.myshopify.com/apps/licenses/authenticate/. Let’s move on to section The customer license management area to learn more about what customers can do with their licenses. 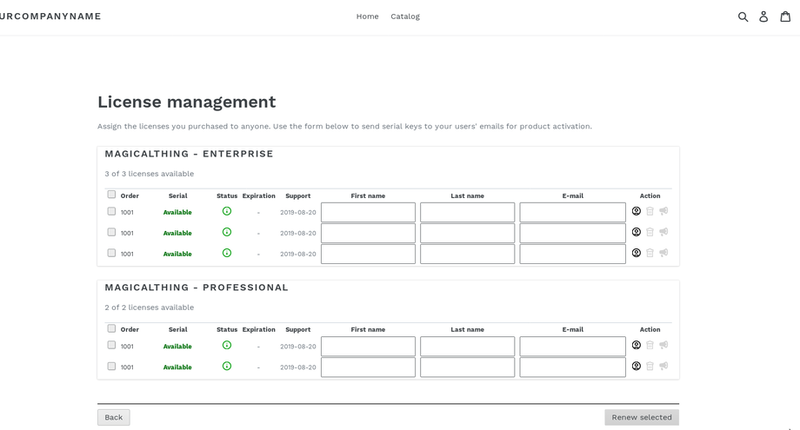 The license manager displays all licenses purchased by a customer, and allows customers to assign their licenses to any user, including themselves. At first, any available license can be assigned to anyone. 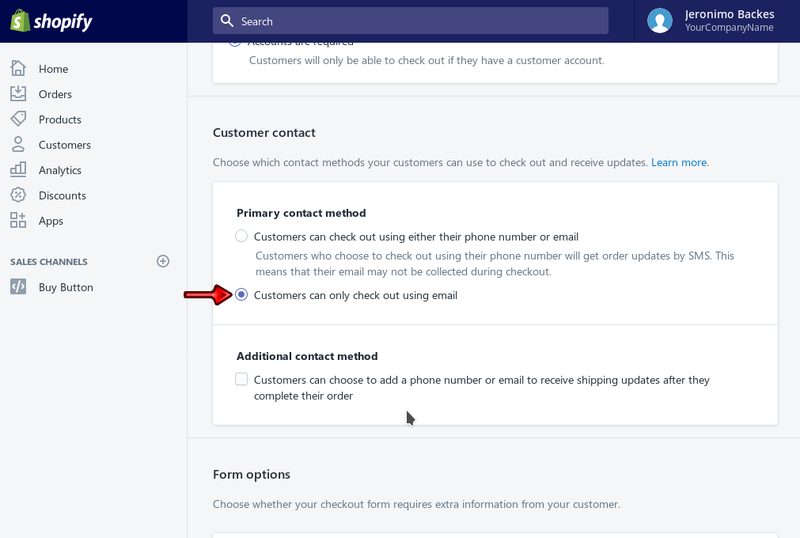 Customers have to provide the user’s name and e-mail, then click the assign icon. Now that we have a serial key, you can execute the registration process from your software, where the user can input his/her license details. This process is demonstrated in section License activation for Java-based applications. If using another programming language, some coding is needed for Generating a license request. At any time, users can renew their licenses. They may want to upgrade to a newer version, released after their upgrade support period, or simply “add time” to their license so it doesn’t expire. Which will take them to the renewal checkout process. 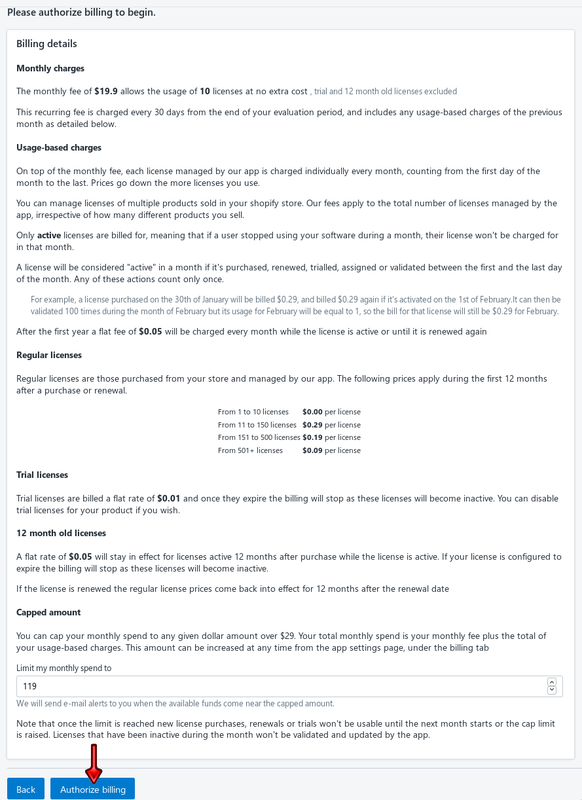 Any renewal discounts configured in the product or variant settings as detailed in section Renewal discounts will be applied to the final price. In the screenshot below the renewal discount was configured to take 100% off the price, for testing. 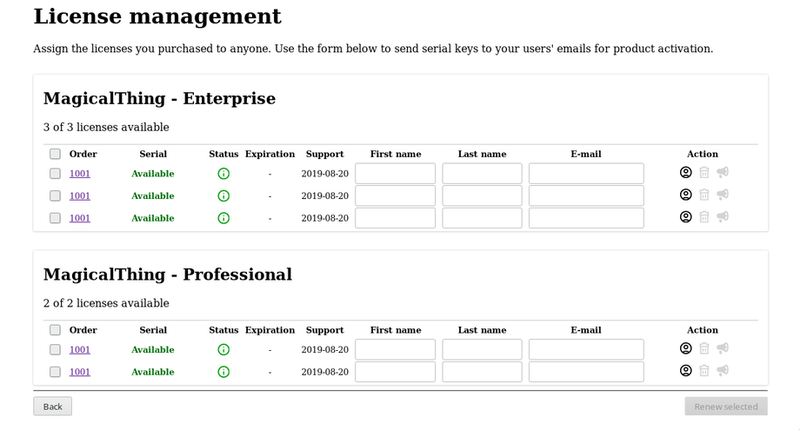 Once the checkout process is finalized and the renewal is completed, the license manager will return the updated support and expiration dates. If you run the test program again with an existing license that has been renewed, you will notice the support and expiration dates will be updated automatically by the server. That covers pretty much every aspect of our licensing solution. Feel free to proceed to the following sections (in any order).